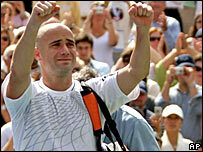 Andre Agassi leaves behind a huge legacy following his retirement from tennis - not least with his fellow players. They were in the locker room to give him a standing ovation following his defeat to Benjamin Becker at the US Open on Sunday, the last match of his colourful 20-year career. And understandably, the players have been falling over themselves to pay tribute to Agassi, perhaps the biggest worldwide star in the sport's history. "He's obviously one of the best ever but I think what makes him so different is his crossover appeal. "He was able to take tennis to a totally different demographic, create interest in tennis at all times." "We all owe a little debt of gratitude for what he's done because he's transcended the sport to become an international superstar, more so than any other tennis player over the last 20 years. "That's helped the exposure, and we all appreciate that." "In the last 20 years, he's been the most important person we've had in our sport. "I think Billie Jean King made huge inroads for women, but Andre made our sport cool, popular with the younger crowd, exciting. "He's beloved. Not many players become what he has become. You know that he is going to be equally famous and equally successful in his post career." "He'll go down as one of the guys who changed our sport in a lot of ways, not only the way he played the game, but also the way that he conducted himself on and off the court. "There's not too many more recognizable people in tennis. The sport probably owes a lot to him." "It's a tough situation. You know it was his last match. Such a great guy. He inspired me when I grew up. Obviously, you kind of feel bad. "You saw him after the match crying. You get emotional, too. You have tears in your eyes." "I'm not going to lie, but I think 50 or 60% of people in the locker room were probably in tears as well and were holding it back. I know I was. "I'm sure all tennis players would love to have the respect that he has from all the players and the fans. Everybody loved him anywhere he went. He's huge." "He's had just such a positive influence I think on players' attitudes. "He also had a great style. I think the game is going to miss him more than probably they miss anyone." "He's a legend of tennis. He is one of the most charismatic players in the world. He deserves respect and admiration from everybody. "He played a lot of years at an unbelievable level. That's very, very difficult."